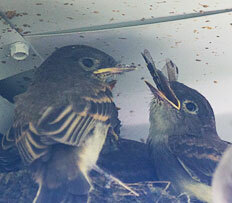 Multitudes of damselflies and dragonflies went down into the mouths of the baby phoebes in their nest outside my kitchen window. Maybe they ate this Violet Dancer. I think it's the loveliest damselfly I've ever seen, with its plums-and-blueberries colors. 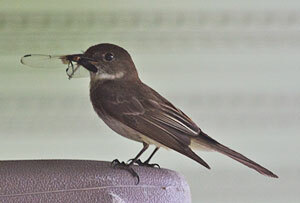 Below is an adult eastern phoebe, poised to deliver a dragonly to the hungry brood. And here one of the babies is swallowing one. Even if you already own binoculars, this one will let you see something special. Nothing else lets you look at dragonflies, damselflies, and butterflies this close.